What's New in Knee Osteoarthritis Treatments? How is the knee designed, and what is its function? The knee is a joint which has three parts. The thigh bone (femur) meets the large shin bone (tibia) forming the main knee joint. This joint has an inner (medial) and an outer (lateral) compartment. The kneecap (patella) joins the femur to form a third joint, called the patellofemoral joint. The meniscus is a thickened cartilage pad between the two joints formed by the femur and tibia. The meniscus acts as a smooth surface for the joint to move on. The knee joint is surrounded by fluid-filled sacs called bursae, which serve as gliding surfaces that reduce friction of the tendons. There is a large tendon (patellar tendon) which envelopes the knee cap and attaches to the front of the tibia bone. There are large blood vessels passing through the area behind the knee (referred to as the popliteal space). The large muscles of the thigh move the knee. In the front of the thigh, the quadriceps muscles extend, or straighten, the knee joint by pulling on the patellar tendon. In the back of the thigh, the hamstring muscles flex, or bend, the knee. The knee also rotates slightly under guidance of specific muscles of the thigh. What injuries can cause knee pain? Trauma can cause injury to the ligaments on the inner portion of the knee (medial collateral ligament), the outer portion of the knee (lateral collateral ligament), or within the knee (cruciate ligaments). Injuries to these areas are noticed as immediate pain, but are sometimes difficult to localize. Usually, a collateral ligament injury is felt on the inner or outer portions of the knee. A collateral ligament injury is often associated with local tenderness over the area of the ligament involved. A cruciate ligament injury is felt deep within the knee. It is sometimes noticed with a "popping" sensation with the initial trauma. A ligament injury to the knee is usually painful at rest and may be swollen and warm. The pain is usually worsened by bending the knee, putting weight on the knee, or walking. The severity of the injury can vary from mild (minor stretching or tearing of the ligament fibers, such as a low grade sprain) to severe (complete tear of the ligament fibers). Patients can have more than one area injured in a single traumatic event. Ligament injuries are initially treated with ice packs and immobilization, with rest and elevation. At first, it is generally recommended to avoid bearing weight on the injured joint and crutches may be required for walking. Some patients are placed in splints or braces to immobilize the joint to decrease pain and promote healing. Arthroscopic or open surgery may be necessary to repair severe injuries. Surgical repair of ligaments can involve suturing, grafting, and synthetic graft repair. These procedures can be done by either open knee surgery or arthroscopic surgery (described in the section below). The decision to perform various types of surgery depends on the level of damage to the ligaments and the activity expectations of the patient. Many repairs can now be done arthroscopically. However, certain severe injuries will require an open surgical repair. Reconstruction procedures for cruciate ligaments are increasingly successful with current surgical techniques. The meniscus can be torn with the shearing forces of rotation that are applied to the knee during sharp, rapid motions. This is especially common in sports requiring reaction body movements. There is a higher incidence with aging and degeneration of the underlying cartilage. More than one tear can be present in an individual meniscus. The patient with a meniscal tear may have a rapid onset of a popping sensation with a certain activity or movement of the knee. Occasionally, it is associated with swelling and warmth in the knee. It is often associated with locking or and unstable sensation in the knee joint. The doctor can perform certain maneuvers while examining the knee which might provide further clues to the presence of a meniscal tear. Routine X-rays, while they do not reveal a meniscal tear, can be used to exclude other problems of the knee joint. The meniscal tear can be diagnosed in one of three ways: arthroscopy , arthrography, or an MRI. Arthroscopy is a surgical technique by which a small diameter video camera is inserted through tiny incisions on the sides of the knee for the purposes of examining and repairing internal knee joint problems. Tiny instruments can be used during arthroscopy to repair the torn meniscus. Arthrography is a radiology technique whereby a liquid is directly injected into the knee joint and its internal structures thereby become visible on X-ray. An MRI scan is another technique whereby magnetic fields and a computer combine to produce two- or three-dimensional images of the internal structures of the body. It does not use X-rays, and can give accurate information about the internal structures of the knee when considering a surgical intervention. Meniscal tears are often visible using an MRI scanner. MRI scans have largely replaced arthrography in diagnosing meniscal tears of the knee. Meniscal tears are generally repaired arthroscopically. Tendinitis of the knee occurs in the front of the knee below the kneecap at the patellar tendon (patellar tendinitis) or in the back of the knee at the popliteal tendon (popliteal tendinitis). Tendinitis is an inflammation of the tendon, which is often produced by events, such as jumping, that strain the tendon. Patellar tendinitis, therefore, also has the name "jumper's knee." Tendinitis is diagnosed based on the presence of pain and tenderness localized to the tendon. It is treated with a combination of ice packs, immobilization with a knee brace as needed, rest, and anti-inflammatory medications. Gradually, exercise programs can rehabilitate the tissues in and around the involved tendon. Cortisone injections, which can be given for tendinitis elsewhere, are generally avoided in patellar tendinitis because there are reports of risk of tendon rupture as a result. In severe cases, surgery may be required. A rupture of the tendon below or above the kneecap can occur. When it does, there may be bleeding within the knee joint and extreme pain with any knee movement. Surgical repair of the ruptured tendon is often necessary. With severe knee trauma, such as motor vehicle accidents and impact traumas, bone breakage (fracture) of any of the three bones of the knee can occur. Bone fractures within the knee joint can be serious and may require surgical repair as well as immobilization with casting or other supports. What are diseases and conditions that can cause knee pain, and how are they treated? Pain can occur in the knee from diseases or conditions that involve the knee joint, the soft tissues and bones surrounding the knee, or the nerves that supply sensation to the knee area. The knee joint is commonly affected by rheumatic diseases, immune diseases that affect various tissues of the body including the joints. Arthritis is associated with pain and swelling of a joint. The causes of knee joint pain and swelling range from noninflammatory types of arthritis such as osteoarthritis, which is a degeneration of the cartilage of the knee, to inflammatory types of arthritis (such as rheumatoid arthritis or gout). Treatment of the arthritis is directed according to the nature of the specific type of arthritis. Tumors involving the joint are extremely rare. They can cause problems with local pain. 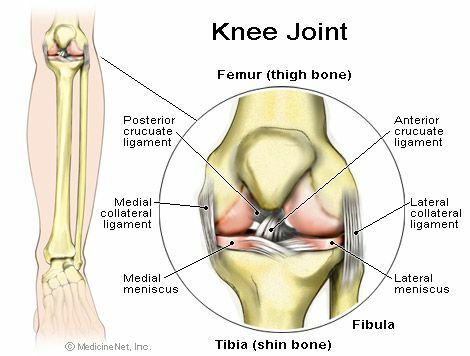 The collateral ligament on the inside of the knee joint can become calcified and is referred to as Pellegrini-Stieda syndrome. With this condition, the knee can become inflamed and can be treated conservatively with ice packs, immobilization, and rest. Infrequently, it requires a local injection of corticosteroids. Chondromalacia refers to a softening of the cartilage under the kneecap (patella). It is a common cause of deep knee pain and stiffness in younger women and can be associated with pain and stiffness after prolonged sitting and climbing stairs or hills. While treatment with anti-inflammatory medications, ice packs, and rest can help, long-term relief is best achieved by strengthening exercises for the muscles of the front of the thigh. Bursitis of the knee commonly occurs on the inside of the knee (anserine bursitis) and the front of the kneecap (patellar bursitis, or "housemaid's knee"). Bursitis is generally treated with ice packs, immobilization, and anti-inflammatory drugs such as ibuprofen (Advil, Motrin) or aspirin and may require local injections of corticosteroids (cortisone medication) as well as exercise therapy to develop the musculature of the front of the thigh. The knee joint has three compartments. Causes of knee pain include injury, degeneration, arthritis, infrequently infection, and rarely bone tumors. Ligaments within the knee (cruciate ligaments) and on the inner and outer sides of the knee (collateral ligaments) stabilize the joint. Surgical repair of ligament injury can involve suturing, grafting, and synthetic graft repair. Routine X-rays do not reveal meniscus tears, but can be used to exclude other problems of the bones and other tissues. The knee joint is commonly involved in rheumatic diseases, immune diseases that affect various tissues of the body including the joints. Clinical Primer of Rheumatology, Lippincott Williams &amp; Wilkens, edited by William Koopman, et. al., 2003. Kelley's Textbook of Rheumatology, W B Saunders Co, edited by Shaun Ruddy, et.al., 2000.